It’s one of those “what if” projects that people love to talk about. Wouldn’t it be cool if Julien Baker, Phoebe Bridgers and Lucy Dacus collaborated? All three of these artists have created some of the most emotional, soul-searching and heart-rending music in recent memory. They each have unique voices and songwriting styles that run adjacent to each other. They arrived on the scene fully-formed and kept evolving throughout their individual releases. Their new supergroup, boygenius, takes the best of each of them and brings those pieces together. The self-titled EP keeps the cathartic directness intact while pushing their creativity further. But really, it’s hearing these musicians play and sing together that makes boygenius an excellent endeavor. Each artist arrived at the recording sessions with some in-progress work but left enough room to write songs from scratch. In either case, every tune has some level of contribution from Baker, Bridgers and Dacus. On the Baker-centric Stay Down, Bridgers and Dacus playing a supporting role with their backing vocals. The music blooms with wonderful flourishes, from gentle guitar plucks and off-kilter drum fills to subtle bursts of violin. On Bite The Hand, Dacus’s earthy timbre balances the song against Baker's and Bridgers's higher pitches. Their voices weave between each other, harmonies ascending until they reach a pinnacle of catharsis. Some of the EP’s best moments come from when the artists push each other outside of their comfort zones. At its start, Me & My Dog sounds like a near-complete Bridgers song. Her voice rings out with excellent lines like “I had a fever/Until I met you/Now you make me cool.” Once the chorus hits, all three voices ring out magnificently as the instrumentation builds. Then towards the end, Bridgers belts out an immense note, screaming “I dream about it/And I wake up falling.” It’s her strongest vocal performance to date. Salt In The Wound is one of the heaviest songs from any of the three artists. It’s filled with slow, massive, speaker-shaking guitar chords and crashing drums. To close the track, Baker rips out a glorious, shredding solo. It fully displays what a monumental talent she is on the guitar. The EP ends beautifully with Ketchum, ID, an acoustic folk ballad about missing home while on the road. Each artist gets her own verse while the chorus melds their voices together into a passionate and melancholy reflection. Together, they sing “When I’m home I’m never there/Long enough to know.” Recorded around a single microphone and with only an acoustic guitar, it’s an incredibly powerful piece of music. The track is worth the creation of boygenius alone. All these songs stand out for their craftsmanship and collaboration, not only between three artists but also three friends. 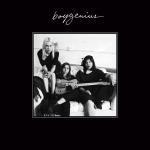 While Baker, Bridgers and Dacus are all excelling in their solo careers, boygenius lets them try something new with someone there to back them up. No longer in isolation with their own turmoil and emotions, boygenius gives each artist more light to combat the darkness.